Our life insurance brokers are committed to getting you the best possible coverage at the best price! 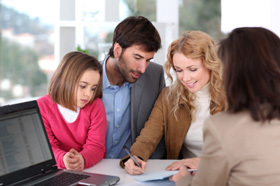 If you are in the market to purchase life insurance, it can be very beneficial to work with an independent insurance broker for a few reasons. A captive life insurance agent has a direct relationship with the insurance carrier, which means their interest is with the provider, not the life insurance consumer. A life insurance broker has contracts with numerous insurance companies they represent meaning that their interest is more directed at getting the client the best possible contract. As consumers become more reliant on using the internet to educate themselves on life insurance, life insurance brokers are forced to adapt. As a company that prides itself in connecting Canadians with the best advice through our brokers in Canada. Solutions Financial works hard at ensuring our brokers are committed to getting you the best possible coverage at the best price.